These are exciting times for the geekStarter community! On June 10 and 11, geekStarter teams gathered to share and celebrate their projects and to learn from expert guests and mentors how to succeed at competitions and, more importantly, how to make a difference in the real world. Highly anticipated events like these are at the core of geekStarter, a program operated by MindFuel with funding from Alberta Innovates. 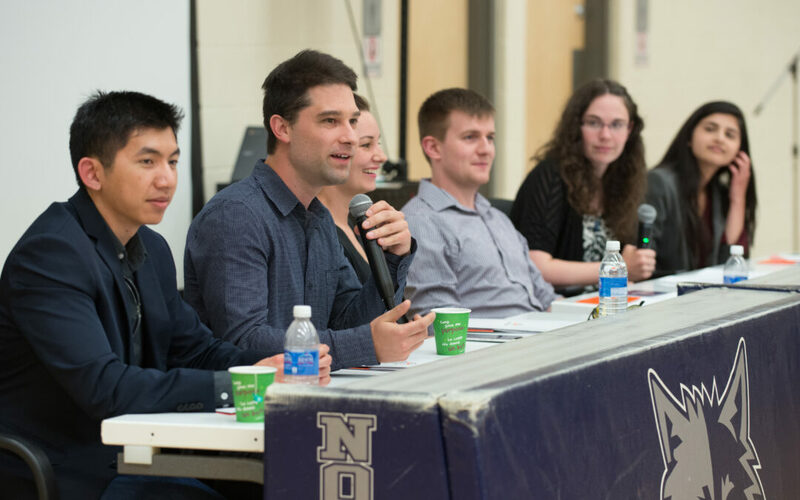 They are key to Alberta teams’ recurring excellent performance at competitions such as the international Genetically Engineered Machines (iGEM), and plant the seeds for start-up companies in new technologies such as synthetic biology. The jamboree culminated with the top three teams winning special awards, which the judges chose carefully based on each team’s performance and particular strengths. Team APEX Robotics from Calgary won the Most Marketable Project Award for their self-driving snow cleaner, while teams Lethbridge High School iGEM and Canmore’s OLS Syn Bio shared the Best Communication Award for their synthetic biology projects on making biological ink and sorting plastics, respectively. The next day, newly on-boarded geekStarter iGEM teams from Edmonton (University of Alberta and Urban Tundra High School), University of Calgary, and University of Lethbridge attended geekStarter’s Collegiate & iGEM Season Kickoff Event held in Calgary. “This was an incredible opportunity to learn and collaborate!” said a participant. “All speakers gave relevant knowledge and the event has given me more confidence in our ability to achieve our goals,” said another. This weekend’s productive events offered geekStarter teams much food for thought and a bounty of new ideas and opportunities for networking and mentorship. We trust the inspiration and learnings will go a long way and wish them good luck with their projects!